2005 renewal application for medical license in Massachusetts. Summary of Rhode Island medical license and controlled substance license for Rebecca Hathaway Allen, MD. Rhode Island Controlled Substance license details for Rebecca Hathaway Allen, MD. 2006 renewal application for medical license in Massachusetts. Rhode Island medical license details for Rebecca Hathaway Allen, MD. 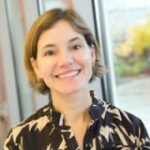 Staff profile for Rebecca Allen, MD, at the Hospital of Central Connecticut. 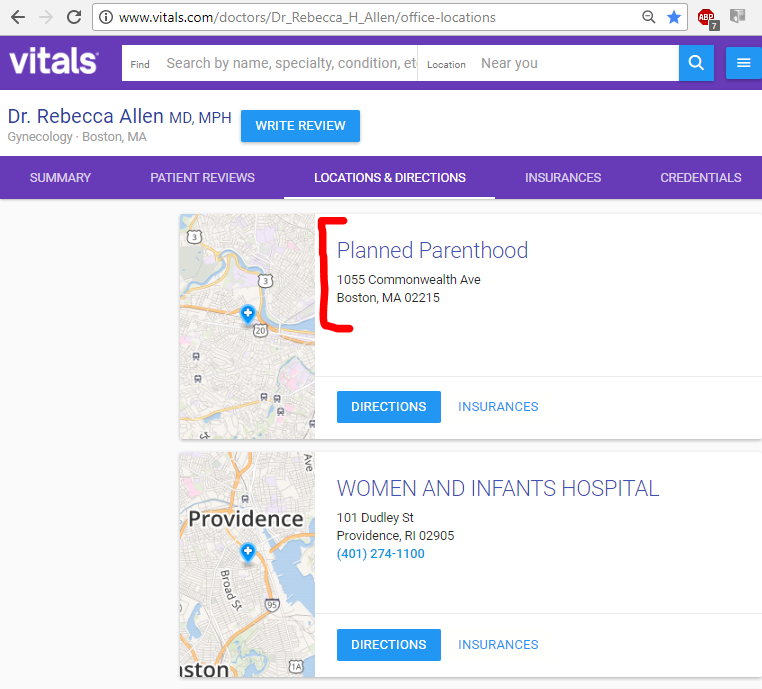 Sharecare.com listing for Rebecca H. Allen at Planned Parenthood abortion clinic in Boston (1055 Commonwealth Ave). Vitals.com listing for Rebecca H. Allen at Planned Parenthood abortion clinic in Boston (1055 Commonwealth Ave). Staff profile for Rebecca Allen at Women & Infants Hospital of Rhode Island. Women & Infants Hospital of RI -- "Meet the Team - Obstetrics"
"Meet the Team" -- Obstetrics staff profile summary for Rebecca H. Allen. See page 2.
eHealthInsurance.com listing for Rebecca H. Allen at Planned Parenthood abortion clinic in Providence, RI. Note: Clinic recently moved from 111 Point St to 175 Broad St.
Doximity.com profile for Rebecca Allen, MD. Note abortion research studies on page 4. Profile for Associate Professor of OB-GYN Rebecca H. Allen. at Brown University Medical School. 2015 abortion research project grant for Rebecca Allen. See page 3. Listing for Rebecca Allen at Planned Parenthood abortion clinic in Providence, RI. Note: Clinic recently moved from 111 Point St to 175 Broad St.
2014 grant from the Society of Family Planning, an abortion lobbying group. 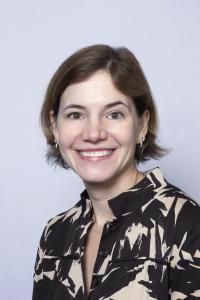 Dr. Rebecca Allen receives a grant for her abortion study: "Helping women choose between local anesthesia alone and IV sedation for first-trimester surgical abortion." 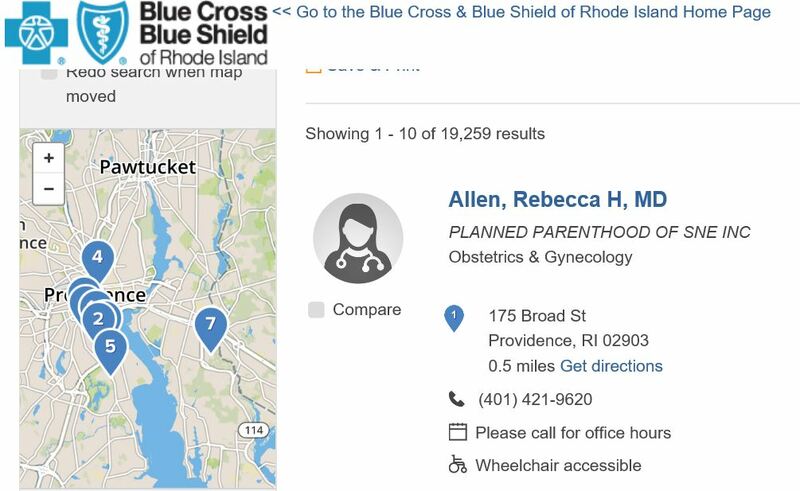 Blue Cross/ Blue Shield listing for Rebecca Allen at Planned Parenthood abortion clinic in Providence, RI. Rebecca H. Allen listing at Greater Boston PP League of Massachusetts abortion clinic.